from 22 to 24m², pleasant comfortable, perfectly equipped, telephone, television, air freshener, WIFI. 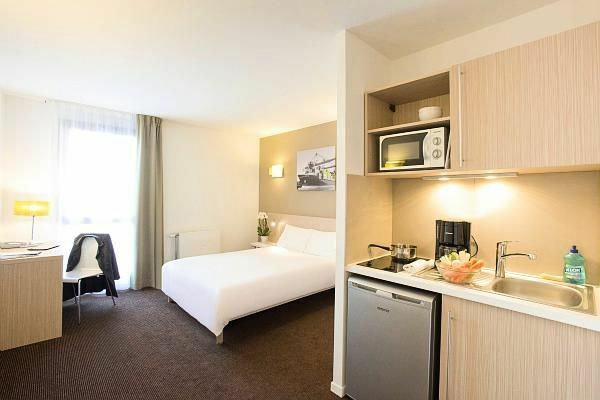 Aparthotel Adagio Access Le Havre les Docks is located in Le Havre, in the heart of the lively Docks district, 100 meters from the Docks Océane shopping center and 10 minutes from the historical center classified as a UNESCO World Heritage Site. The train station is a 10-minute walk away and the establishment offers direct access to the Cruise Terminal and is in the immediate vicinity of the Exhibition Hall, Océane Congress Center and the Chamber of Commerce. Aparthotel with a breakfast room, laundry facilities (extra charge), free wi-fi internet access, covered parking (extra charge). Studio for 2 people from 22 to 24m² with 1 double bed, a kitchen, an office area, a bathroom with shower or bath and toilet. The kitchen in this studio is equipped with crockery, ceramic hob, fridge, microwave, & nbsp; a coffee maker. The apartment is also equipped with a television with a direct dial telephone (extra charge), an individual safe, air conditioning and Wifi internet access (free).